It has been about a year since Lenovo released its Android version of the Yoga Tablet 2, so it was only a short matter of time before we would hear about an update if they plan on continuing the mid- to upper-range line of tablets. 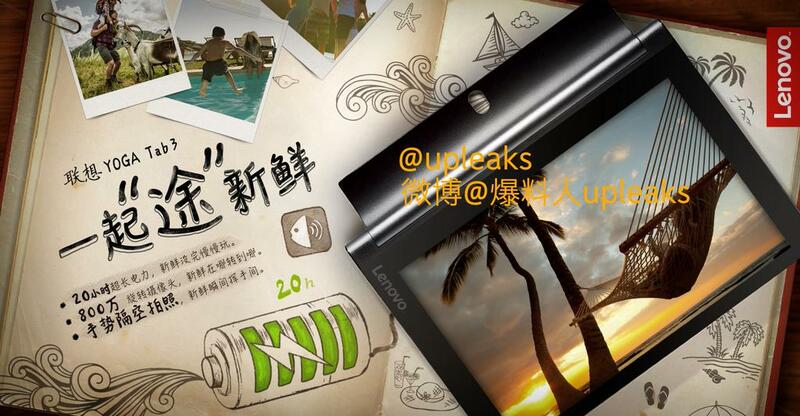 Twitter-based @upleaks has posted two images that appear to be marketing renders for Asian markets that feature the Yoga Tablet 3. While they leave a lot of mystery as to what's inside the upcoming device, they offer a glimpse of what is to come. In this article's hero image, you may notice one peculiar aspect of the tablet's construction: a camera on the signature kickstand's hinge. It looks like this could be useful for things like video chat while the tablet sits on a desk or other flat surface. Of course, the camera would presumably be hidden when the kickstand is flipped back into the back of the tablet. You might also notice that in the image just above, the tablet—especially in the hinge area—doesn't appear to be the same device. The first leaked image's hinge is a more gunmetal gray color, lighter than the black body of the device. There is also a separator near the camera that makes it look like the camera may not even be part of the hinge. These visual details are absent from the second render. Of course, the text offers some interesting information in the second leak. Without any non-English language competence, it is clear that Lenovo has at least planned to claim that the Yoga Tablet 3 will have 20 hours of battery life. Having spent some time with the current version, I can attest to the fact that the longevity can be absolutely herculean at times. With that said, the Tablet 2 only promises around 10 hours. And while you can't see a rotating camera, my attempt to translate the text reveals what I believe to be a reference to an 8MP, rotating camera. @upleaks provided two other nuggets of information in addition to the photos. First is that the device will be announced/released in September, perhaps aligning with IFA. 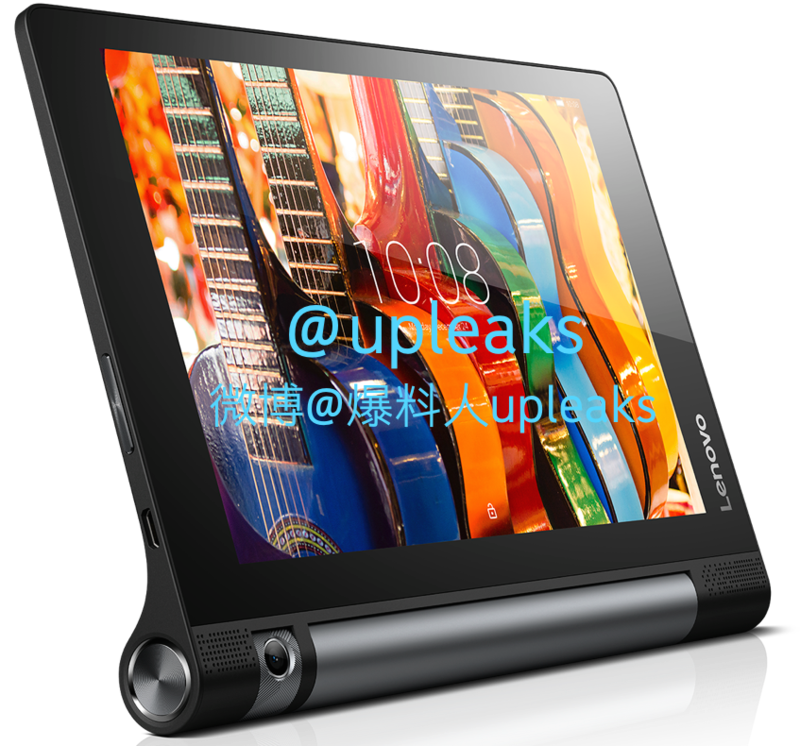 Second is that, like the current generation, there will be 8" and 10" versions of the Yoga Tablet 3. We always have to take these things with a grain of salt, but @upleaks has been right about things before. In spite of the visual inconsistency between the two images, the fact that the second references a rotating camera bodes well for the validity of both. We'll have to keep waiting for more details on processor, OS version, and the like.